It’s all very well losing the weight, but keeping it off can be another problem altogether, especially if you chose a rapid weight loss diet as your method for losing weight. Once the weight is off, there is the temptation to return to your previous way of eating (WOE) and a consequent build up of fat again. Been there, done that, got the (bigger) T-shirt back again! It’s not the fault of the diet – it promised to get the weight off and it worked. It’s just that KEEPING weight off requires changing your normal way of eating in some way. This is where you pass the fruit bowl and take a piece of fruit and then another. Fruit is good for most people, however, most of it is high in natural sugar, so eating a lot can add calories that you weren’t counting on consuming. This also applies to the cookie tin, a quick “treat” from the local store, a piece of cake in the office to celebrate someone’s birthday and a friend sharing a bag of candy. There are so many impulse opportunities in our lives these days and it is hard to say no to them all. You can deal with the fruit bowl and cookie tin problems by not keeping them in the house. I know someone who always has a full cookie tin, “in case someone calls”. They deny eating them but their visitors are not sufficient to account for the cookie tin always being full of fresh cookies! This is where your mouth gets bored with nothing to do, and it wants something to chew. Very often this translates to raiding the fridge for snacks or a sandwich, to keep you going until the next meal time. You may find some help by using sugar free chewing gum. This gives your mouth something to do while not adding sugar to your diet. Just take care with sugar free gum as it can have a laxative effect, if you use too much. Hot drinks (no sugar) can also be helpful. For a refreshing drink, try a few slices of fresh ginger in hot water, then add lemon juice. If it’s too hot for a warm drink, this is just as nice allowed to cool, or even iced. This is where you are under stress or anxious and find that eating, especially the so-called comfort foods like potatoes and ice cream, helps relieve the stress or calm the anxiety. This requires finding ways of reducing stress and anxiety without using food. 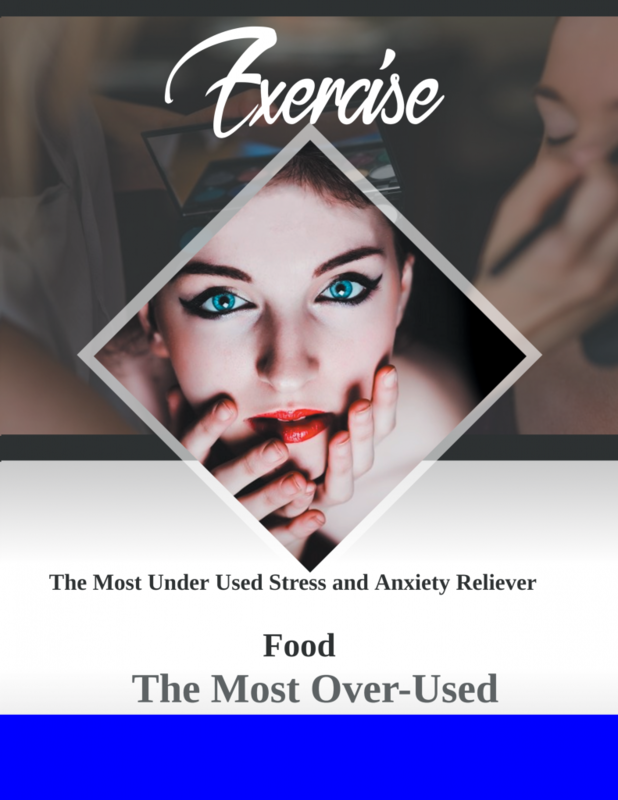 It has been said that exercise is the most (and best) under-used stress and anxiety reliever available and food the most over-used. There are a few ways of keeping the weight off, without feeling constantly deprived and without constantly having to refuse those little treats. Try the 5:2 diet. On this diet, you eat normally 5 days a week and stick to 500 calories a day (women) or 600 (men) on two days a week. You can choose which two days. Many people find a Monday and a Thursday to be their best days. This is also a long term diet strategy that a number of people use. If you don’t need two days to keep your weight down, then use 6:1 and have just 1 day a week where you restrict your calories. Many people find this doable by telling themselves, that it is just for today and tomorrow they can eat “normally”. It works because it helps to regulate the appetite and also people do not eat “enough for two days in one” on the following day so the overall calorie intake for the week is reduced. Then there is the 16:8 diet. This refers to the 24 hour day, in which you eat ONLY during a window of 8 hours, staying away from food (not water) for the other 16 hours of the day. This is doable by stopping eating 4 hours before bedtime, assuming you are in bed 8 hours and waiting for your breakfast until about lunchtime the next day. If you have finished your meals by, say, 6pm and can wait until 10am the next day before eating your breakfast, you will have an 8 hour window for eating between 10.00am and 6.00pm. You can move the hours around to suit yourself. You could work on a slow increase in calories or carbohydrates. If you have lost the weight you need by whatever means and are now moving onto a maintenance diet, you could try increasing your intake slowly, whether in terms of calories (low calorie diets) or in terms of carbohydrates (low carb diets). This requires self discipline, to calculate a little extra, then sticking to that until you find the point at which you no longer lose weight and then stay at that level of carbohydrate or calories.The Atkins diet (low carb) provides suggestions for gradually increasing your carb intake at the stage 4, maintenance level, and the 800 BSD provides suggestions for gradually increasing your calories. There is also one suggestion that you should eat ten times your desired body weight in calories each day. This is said to reduce your weight while you are heavier than that and keep you there once you have reached your desired weight. If your desired body weight is 140 pounds, then on this diet, you could eat 1400 calories each day. It is of course, vital that you find a healthy long term diet that keeps you at your desired healthy weight and also provides all the nutrients you need for health. One recommended diet for this is the Mediterranean diet, which includes plenty of vegetables and healthy fats, as well as protein. The Mediterranean diet is one that you could stick to for a life time if you choose. If comfort eating is a problem, whether just at certain times or because your life is stressful anyway, then find a way of reducing stress and anxiety without using food as a crutch to ease your stress or anxiety. This may involve letting certain people go, taking up meditation, listening to relaxation tapes or learning to become aware of when you are using eating to reduce your stress and anxiety levels. Exercise can be a great stress and anxiety reliever. If you are taking medication for relieving stress or anxiety then do not change your dosage without consulting your medical adviser. Exercise can be used in conjunction with medication to provide great relief and reduce reliance on food for comfort.